Latest chapbook out is “She Needs That Edge” published by Nixes Mate Press this January. Welcome, grab a tea, take a comfy seat and enjoy my WordPress site. I am a writer, local historian, genealogist, photographer and grandfather. I adore the counter intuitive. Suckled on ‘Under Milk Wood’, William Blake, T.S.Eliot, Fleetwood Mac ‘Rumours’, Holst’s ‘The Planets’, in adolescence ‘Waiting For Godot’, Bradburys The Illustrated Man, Brechts Threepenny Opera, Ted Hughes. At Hull University I had a play performed in the Gulbenkian Theatre called Still Children’. 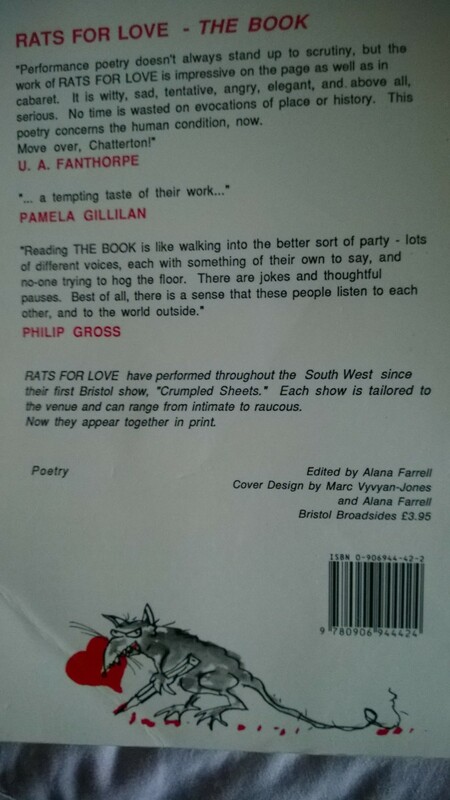 I was a member of the Bristol Poetry Performance groups ‘Rats For Love’ and ‘Dead Rats On Leave’, performing in venues all over the South West. 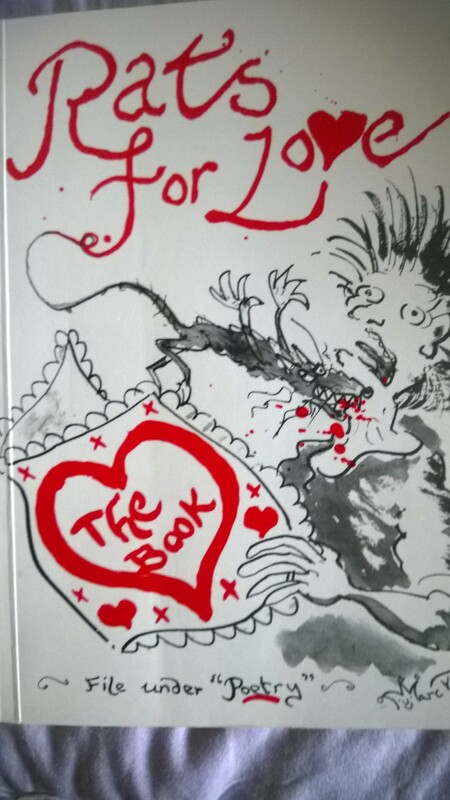 Amongst others publications I have work in their 1993 Anthology ‘Rats For Love: The Book’. Writing up the rest of my family history history research, that includes the tale of Charles Teft Laurence, Master Mariner, a Victorian tale of apprenticeship, marriage, shipwreck and family tragedy. Invisible Town (inspired by Italo Calvinos Invisible Cities) and Wombwell early and late strolls are daily tweets building up to a larger work. How does my work differ from others of its genre. Strangely, after I had completed most of my family history (2010-2014), I discovered direct connections with my first collection of poetry, The Fabulous Invention Of Barnsley (1993). My ancestor Thomas Laurence was Chairman of the Liverpool Select Vestry that administrated the Liverpool Workhouse, in ‘The Gold’ I recount an experience of Barnsley Workhouse. There are many other connections. If you like, see if you can find them. Miscellaneous Articles, including one about how art leads to art, the idea of ‘reverie’ and so on. I want to make sense of who I am, where I came from and where I live. An impossible but engrossing job. I want to make sense of why others live the way they do, who they are and what they do. In the past, it seems, our job or trade defined us and the place where we lived. What do we mean by ‘place’? Landscape? The importance of dialect and geology in giving a sense of belonging. I wish to discover the marvellous in the everyday commute. I explore ways of Seeing, ways of telling, ways of making sense. How we piece what seems absurd into what is reasonable. Incongruity, surrealism, ‘kitchen sink’, super reality. Using all five senses, all aspects, history, society, encompass all of it. As for writing process. I have an idea then one of two things happen: I hear the voice then have to really listen and record what it has to say in the way that it says it accurately, or it comes all at once and I’ve all on to get it down. I sometimes have to return and rewrite as I did not hear the voice clearly the first time. The voice, monologue in some form, not usually confessional, seems to be my main mode of expression. A workshop for sixth formers was broadcast on Radio Five Live. And I also read some of my poetry on BBC Radio Bristol. My first pamphlet of poetry was ‘The Fabulous Invention of Barnsley’ favourably reviewed by Ian McMillan, among others. I taught creative writing, literature and local history for the Workers Educational Association for eight years, part time. I have recently started combining photography and poetry, inspired by Ted Hughes ‘River’. Writing is landscape, memory, history, dialect is like Burgess’s, Hoban’s language of the future. If you like space for your imagination to work, enjoy inclusiveness, perhaps this is for you. I found you when I was looking for information on Thomas Laurence, it was interesting to read your articles on the Laurence ancestry, Thomas Laurence 1781 -1868 spelt with a (u or a w) was my 3rd great grandfather, I am doing my family tree on the English side which is the Laurence, and on the French side which is Heron on my grandmother’s side, she married George Laurence who was born in Pendleton Lancs. he Lived in France from the age of 18 or 19 and worked in Chantilly as a Groom. Thanks for the Like and Follow on my blog! Thanks for the Likes and Twitter mentions. Much appreciated. You’re more than welcome, Billy. Your posts are thought provoking and must reads. Goodness me, Paul, you have a longer ‘About’ than me … and you’ve arrived on my doorstep, so to speak, via California! And I’ll be in Wombwell this evening! I cannot forget him, Deborah. He gave me confidence in my own ability at an early age. He was and is an inspiration. I was,sad to read of his death, though sometimes his heart and body were so fragile with drink I often thought he hadn’t long. I hope you enjoy my site. Love to hear what you think of my published chapbooks. Great to hear from you again. Thank you for replying…I,m not actually sure what a chapbook is to be honest…is it an online book or something physically existing?. I didnt know Brian had died, but I thought he might have as I have done searches for him. I love the title of that Barnsley collection , your first I think. Its my birthplace and where I lived alone and was creative, so I have fondest memories of it…people there were such characters and friendly. I wish I,d stayed. Do you remember Geoff? He was such a decent man, and a nice friend. and there was Gordon and christian John. I still have written through the years but not formally, and its mainly memes at the moment. Thankyou for following my blog. A chapbook is what the English would call a pamphlet. Apparently today it is a minimum of 40 pages long. I’m honoured you like the title of my first. It was an adventure in 1993. Only now am I getting back to getting more published. I remember most who met in the CEAG building, now demolished and replaced by a car park. I am glad you have continued with your creativity. I have never given up writing because it is physically painful to do so. My imagination demands a place at the table. I still get an immense buzz from it. Hopefully my youthful attempt at depth is now leavened by sharp humour. I still carry a bag, sometimes with a kindle, a surface and one or two books. Hey, I hope I havent unfollowed you Paul, cos I clicked ‘follow’ again thinking I hadn’t done it right the first time, but apparently I had, cos you just said thanks for following you. To be honest, I,m not really sure how to use this site, I tried to post something and then lost it, and I keep ending up on the ‘stats’ page of all places…and as we all know, stats are just lies, damned lies. And although , I’ve been a member for years, I,ve never used it. I did manage to get to your blog ok, though, which is the main thing. what are you writing at the moment. I don,t just mean for published. I mean what,s the last thing you wrote,or feel like working on ?? I think its fun to be creative too…AND therapeutic, sort of…you can try out saying ,lots of things imaginatively through the mouths of others…characters indeed ! My dad came to see me today. He lives at Whitby. We don,t see him much. I tnought it was strange that we were laughing and talking while afew days ago I was singing ‘my father never loved me’ to my casio. (which was altogether out of character for me to do – I,m sure I hardly ever think about it at all and never when I,m at my casio ha ha)..but thenI thought today (rather generously 😆) maybe his father never loved him either, so he had nobody to teach him how to do it…makes me think of that Philip Larkin poem ‘this be ther verse’. I love chatty. I had problems with WordPress at the start. But, as with all things practice and perseverance pay off. All things pass. My old comp. school demolished. The familiar ever becomes unfamiliar. I have no interest in cars, either. Never passed my test. Walking helps me think and for us. Getting into the voice of characters can be fun, but harrowing at times. indeed…..cars, who needs em ! As a poet/writer manque myself, I’m very much enjoying reading your work. I hope you won’t mind if I comment now and then. Hi Paul, here’s what little I know about the Old Homestead. It was owned by a family called Mackeridge. (I’m guessing at the spelling) They lived in one of the four houses, my grandparents, who were called Hague lived in the second one, a family called Dixon had another and I can’t remember the name of the others. The houses had cellars, through which a stream flowed, meaning they were excellent for food storage but creepy. They had gas lighting, which was still in use in the late 1950’s; I remember it from my childhood. The bath was underneath the kitchen window and was covered with a big wooden shelf, which made a work surface on which my grandma used to bake bread. And, of course, it had a black leaded range. Finally got your book, She needs that edge, and I look forward to reading it. May take me a while as it is amongst a large book pile! Bless you Alex. Once you get to and finish it, please can you leave a review either in Amazon or Goodreads. I apologise for asking more of you. Absolutely, no problem and it will be a pleasure! Hi, could I ask you to review a poetry journal?